It’s time for the Academy to take the next step in evolution. On Tuesday, the results of voting by the more than 5,700 movie industry insiders who make up the Academy of Motion Picture Arts and Sciences will be in. There will be five nominees for the Best Supporting Actor Oscar, and by all accounts Andy Serkis will not be among them for his critically lauded turn in Rise of the Planet of the Apes. Caesar looks like the handiwork of computer animators but moves like a real chimp. Unless they’ve had the privilege of spending two days on the set of Rise of the Planet of the Apes and watching Serkis in action, it’s hard for voters to gauge how much the man who breathed life into Gollum and King Kong brings to the performance. However, seeing him on the set – loping around on arm extensions with those ridiculous markers pasted all over his face and the wetsuit-like outfit he wears – you understand that he isn’t just monkeying around. Before the cameras started rolling, he watched hours and hours of videotapes of chimpanzees in the wild and mapped out Caesar’s backstory in his head. No offense to James Franco, who proved in 127 Hours that he could act with one arm tied behind his back (rimshot). But between takes on the set of Rise, Franco, the actor with the film’s top billing, would find a patch of Vancouver grass in which to sit and read. Serkis, meanwhile, was almost always stretching and practicing like an Olympic athlete. Filming it is anything but easy for a performance capture artist like Serkis. The dozens of markers on him are picked up by the ring of cameras that line the “volume” – a room in which most of the acting is done – and translated into a 3D model of his body as he moves. That skeletal shape can be converted in the post-production animation process into just about anything that’s roughly human-shaped. 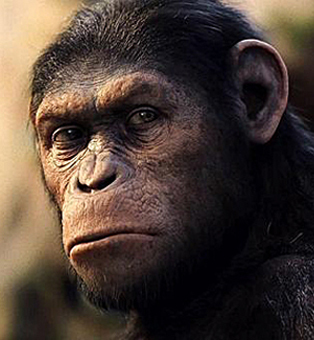 Serkis didn’t just play Caesar in the film – he and his fellow performance capture actors also filmed several of the background apes for the captivity and bridge scenes. Let’s see Christopher Plummer, Albert Brooks, Jonah Hill or any of the other probable Best Supporting Actor nominees do that. Ask Jamie Bell, the star of the recent The Adventures of Tintin, how physically demanding performance capture can be. “It’s physical enough that I threw out a rib and had two misaligned vertebrae making the movie, which obviously is something a little more than voice work,” he told Unwinnable. How did he injure himself? Chasing a tennis ball that would later become an animated cat rampaging through Tintin’s apartment. Serkis, Bell’s costar on Tintin,is a little less apt to get injured, largely because he’s been doing this pretty steadily since The Lord of the Rings: The Two Towers a decade ago. The technology has advanced in leaps and bounds since. The time should’ve been now. Get your stinkin’ paws off Serkis’ Oscar, you damn dirty Christopher Plummer.